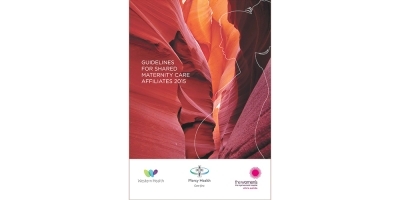 The guidelines for Shared Maternity Care Affiliates provide shared maternity care affiliates with concise, up-to-date guidelines on the provision of shared maternity care at the Women's, Mercy Health, Western Health and Werribee Mercy. They also include information on antenatal care and hospital and community supports for women and health care providers. The guidelines were developed by the Shared Maternity care Collaborative (GP Liaison Units at Royal Women's Hospital, Mercy Health, Western Health and Werribee Mercy) in association with shared maternity care affiliates. At these hospitals, shared maternity care is a major model of care in which a woman is cared for by both hospital staff and a community-based affiliate. The woman attends the hospital for the birth and immediate postnatal care. Shared maternity care aims to provide a community-based, holistic, safe and culturally appropriate model of care for women. Women often choose this model of care as it provides continuity of care, their GP already knows their family and for many women, it is convenient. Developed by a multidisciplinary team of health professionals, the Breastfeeding best practice guidelines present a framework to assist all providers to facilitate the successful initiation of breastfeeding within the early postnatal setting.